Sponge-Rez is a tough, clear, ultra-flexible resin formulated to mend the most common types of catastrophes bodyboards are prone to; worn-out leash anchors, creased bottoms, delaminated decks, hulls or rails, sponge-decks (also known as rash-decks), and semi-fatal gouges. Sponge-Rez works on all types of bodyboard materials including Ethafoam, Surlyn, EVA, Vinyl, and Arcel; however, it will melt styrofoam (EPS) cores. Sponge-Rez also repairs cracked, weathered swim fins. If applied to the fin blades, it increases their stiffness and thrust. Surface should be clean, dry, and free of dirt, and or wax. Use in a well-ventilated area, preferably outdoors. DO NOT deliberately inhale vapors – don’t be stupid or make yourself stupid. Apply liberally on porous surfaces. Use spreader to force Sponge-Rez into the damaged part of the board. Do not apply Sponge-Rez with your fingers. 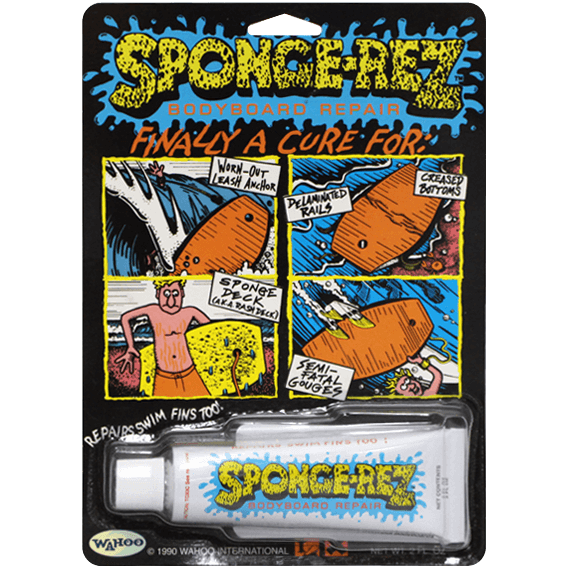 Sponge-Rez will “skin-over” in about 10-15 minutes and feel dry in about 2 hours but a complete cure takes 24 hours – especially when filling deep gouges.